Welcome to CAHL.ca, the official website of our CAHL - Calgary Adult Hockey League. 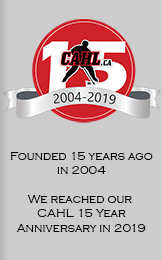 Founded 15 years ago in 2004, our CAHL - Calgary Adult Hockey League is a non-body checking competitive adult recreational ice hockey league in Calgary, Alberta, Canada. Men and women of all skill levels are welcome to become members of our various skill, playing night, or game time based divisions for our winter and summer seasons. "Bienvenue à CAHL.ca", le site officiel de la Ligue de Hockey pour Adultes de Calgary. La Ligue de Hockey pour Adultes de Calgary est une ligue de Hockey sur glace compétitive et récréative sans contact. Les hommes et les femmes de tous les niveaux d'abilités sont bienvenues à joindre nos divisions variées qui se déroule la nuit et peuvent jouer pendant l'Hiver et l'Été. Just a very small selection of some of the Unsolicited Feedback we have received. "Thanks again for organizing the league! Best league I've been apart of for the last 20 years in Calgary!" "This is going to be my tenth season with the Dragons & the CAHL and I have loved every minute of it. Kudos for building a successful league. I hope you still get time to play hockey. Thanks Simon. "The United Nations team in Division A had a fantastic time in the league. They express their thanks and gratitude to yourself and the teams they played. The competition was fun and they were all great guys to play against. Unfortunately, with the make-up of the team (WHL and Jr. A), they are all leaving for various points in the U.S. and Western Canada to their respective camps early next week." "We greatly appreciate it. You have done a lot for us, please let me know if there is anything Ambrose can do to help the CAHL as well. Thanks again and we look forward to the start of another great year." "Thanks again for the great year, as always everything was well organized and officials plus timekeepers in attendance for every game. Your team does a fantastic job! Again Simon, thanks for your help in this regard, and thanks again for all your work over the season. I am sure you know I have played a lot of years of hockey, and I have to say the years in the CAHL have been some of the most fun since Junior Hockey. Your staff and officials are all very friendly and approachable." "Thanks again for being on top of things, really appreciate your quick replies and help throughout this season." "I should have my roster finalized in the next couple of days, thanks for all of your help Simon, we are all excited to get back to playing!" On behalf of the team, I wanted to take this opportunity to thank you for posting photos from the last Mighty Peking Ducks game onto the CAHL home page. The shots look amazing and the gang really appreciates the gesture. Hope you've had wonderful holidays, see you in the second half of the season. "I really enjoy this leauge by far the best leauge I have played in in the past 15 years"
"The officiating, management, etc, has been top notch." "Thanks for the reply and input. That all makes perfect sense for sure! Thanks again for all of you efforts towards our team over the years, it been very much appreciated." "Awesome, thanks, happy to play in it! It's a great league, thanks for setting it up." "this is true, 4 years and not once missing a ref or timekeeper, same refs a lot of the time, very consistent!!" "Thanks sp [sic] much. Team is really coming along. Thanks for being patient with us. Btw, the refs have been so good this season. I have played ******** and *** *** in past and these guys have been the best!" "Thanks so much I really appreciate it. I would also like to mention this is a great league to play in and the referees have been particularly good since I joined. Thank you too [sic] all involved that make this fun hockey league possible." "Thanks so much! It is a fun season this year - the division is nice and evenly matched! Hope you had a great new year and a wonderful holiday season!" "Simon - first off, I'd like to thank you for your help over the last number of years and recognize your association with the HHL. We appreciate your past service and wish you well in future endeavors!" "You run a great league"
"Simon you have been stellar in co-ordinating the Time Keepers for us for many years and we applaud all your support over the years. You are all class and we fully appreciate all that you have done." "And while I'm at it, I should add that, as a team manager, I can imagine you have a pretty tough, thankless job, but I wanted to say thanks for all your work in running the league! We've been in a couple leagues around town and CAHL has been by far the most enjoyable one to be in. We may whine about reffing or calls or the other teams now and then but in the big scheme of it all, we've all enjoyed our time in this league and you've been very good to us (even going back to when one of our players Josh Winters collapsed on the ice and you were one of the first ones to be at the hospital for him!)." "Hi! Just wanted to say I love the league and the organization!" "Great write up on the lycans vs pylons game!" "We are having a great time in the CAHL, not missing our former league at all." "We've found the complete opposite in the CAHL. Specifically with your officials - each and every game we've played so far we've seen really good officiating. And I believe we've had different officials for almost every game. Good officiating to us is about moving the game along, and managing the game. It really doesn't have anything to do with the penalties called or missed - it's about individuals who understand we are paying for a service of recreational hockey which means we get the maximum amount out of ice time, game experience and safety. We've been very happy with this. Simon, if you ever need help with anything regarding league operations I and others on our teams could possibly volunteer our services. Just let us know." "My name is Connor Scott, thanks for the front page accolades today." "this is my fourth season in the cahl and couldn't be happier with how it's gone !" "We've had a great year so far in the CAHL and plan on signing up for the 2016 - 2017 season soon. Thanks for all your work organizing." "You are very welcome, we think you guys are terrific partners and want to be sure you know your business is appreciated"
"Great league that my entire team likes to play in. We are certainly in for winter league"
"You do a great job of having friendly and fair referees. The players are all very nice with a high calibre of clean play." "we've really enjoyed playing the past couple of years." "If at all possible we would like the same group of Ref's that we had last year. They did a fantastic job." "Lastly I'd just like to thank you again for the time and consideration you've put into this issue as other leagues would not have dealt with this as well as you have. Your willingness to listen and communicate with me is very much appreciated." "I'm pretty excited the photographer came out to our game last night." "Thanks Simon, been a heat year and look forward to playoffs. The skill level and lack of dirtiness really sets this league apart from **** and *****. ...Best league by far!" "Simon you run a great league. Very well organized, and you're very attentive towards the teams and are always there to answer any questions and address any concerns."